You stay in a tranquil holiday complex, which has been newly built in 2001 in Moorish style with swimming pool and a children’s playground. The 17 km long, wide and sandy beach of Vera Playa is only few metres away. From the balcony and the private roof-top terrace you have a great sea view and a view of the mountain panorama of the Sierra Nevada. The apartment has a spacious design, is facing southwards and is well sun-lit year-round. Because of that, the apartment is very attractive for long-term rentals, especially during the winter months. Sportive holiday makers will find 4 golf courses in the surroundings. A sports centre with tennis, padel, a golf school and a gym is only 1 km away. Supermarkets in immediate vicinity are easily reachable. The apartment is only 500m from the closest bus stop, from where it is easy to reach every destination in the surrounding area. Specialties: Above the apartment there is a private 80 m² roof-top terrace with two loungers. It offers a great panoramic view of the sea and the mountains. A large nudism area with hotels and apartments is located in immediate vicinity. The 7 km long and 180 m wide powder beach is only 150 m away. The sofa in the living room can be converted into a large sofa bed. Because of its south-facing location, the apartment is especially suitable for holidays outside of the season. For maybe necessary heating periods the apartment is equipped with two fan heaters. Public transportation: Nearby the complex (about 500 m) there is a bus stop where buses pass by every 30 minutes into the directions of Vera or Mojacar with connections to all bigger cities in the further surrounding area. Shopping facilities: Fresh bakery products are offered daily in the apartment complex by a mobile baker. A shopping mall with bars, internet café and numerous shopping facilities on several floors with a supermarket can be found in 1 km. Further large supermarkets are in 1 to 2 km (e.g. LIDL in Vera, about 5 km). The large Consum shopping mall can be easily reached on foot. The apartment is equipped with a digital TV receiver in which you can receive all programmes, especially German ones. The village is about 3 km from the fishing village Garrucha with marine, promenade and its famous sea-fruit restaurants. The picturesque mountain villa Mojacar can be reached within 10 minutes. Almeria, Granada with the Alhambra and the Sierra Nevada are worth a day trip. The coast with the Cabo da Gata is one of the largest nature reserves in Spain. Fantastic, lonely bays invite you to swim and dive. It is directly adjacent to the holiday region and offers marvellous views with its turquoise waters and the wild flamingos. Golf: There are golf courses in immediate vicinity: the 18 hole courses in Mojacar and Cuevas de Almanzora (Desert Springs). 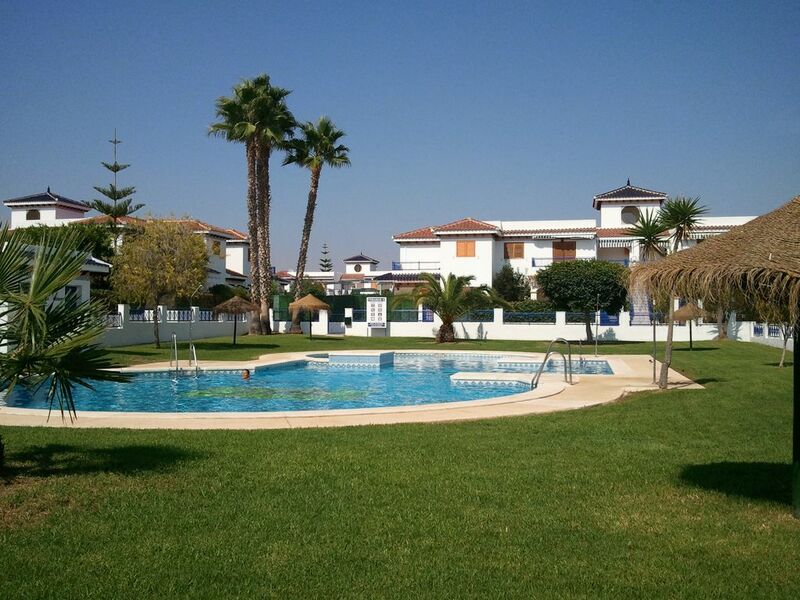 There is a further golf course in Valle del Este, which is directly adjacent to Verama and here you can also find a recently opened beach club at the beach with bar, restaurant and pool. All three courses can be easily reached from Veramar within 15 minutes. The local tennis club of Puerto Rey offers numerous tennis courts and diverse sport facilities in a distance of about 1000 m from the apartment. The telephone numbers of the different golf courses are Desert Springs in Cuevas de Almanzora:+34 678 679387. ** Marina Golf in Mojacar: +34 950 133230. ** Valle del Este in Vera: +34 950 398743. Ski: During the winter months you can enjoy alpine skiing in the Sierra Nevada until April. Eine günstige Langzeitvermietung ist auf Anfrage zu günstigeren Konditionen möglich. Die Preise gelten inklusive Nebenkosten, Für die Schlüsselübergabe,eine Betreuung vor Ort durch meinen Partner und die Endreinigung fällt die oben genannte Pauschale von € 70,- an. WLAN Nutzung ist für € 1,50 pro Tag möglich.